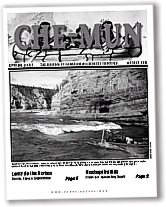 We at Che-Mun, have always had a great interest in northern Quebec. It stems naturally from our canoeing experiences there plus the unique threat the region's rivers are under from that world class dammer Hydro-Quebec. Our trips have taken us down the George River twice, across the Ungava Peninsula three times, as well as down the newly endangered Rupert River . In addition, in my role as a journalist, I have written about the James Bay hydro projects and toured the dams and towns and spoken with people on both sides of the issue. It remains a remote region that crops up occasionally in the mainstream press. Nowadays, most interested parties have their own Web sites and the burgeoning Ottertooth.com site, our online home, specializes in this issue. Run by environmental activist, Camp Keewaydin paddler and historian Brian Back, the Ottertooth site is impressive in both its dedication to the issues, sophisticated use of maps and its insight. And there’s lots to report about as northern Quebec has regained the threatening focus of the Quebec provincial government and its agencies. While the natives and government were once bitter enemies, the two know seem to be on the same wavelength, as a couple of recent deals would seem to attest. This is no small story and will doubtless spawn a raft of articles and books both scholarly and otherwise. The fact is, the chickens are sleeping with the foxes and getting very well paid for it. We have reported previously on the deal to renew damming of the James Bay rivers and thanks to one of Ottertooth’s many superb maps, we can get a look at the latest plan to extract power from the Rupert and how it fits into H-Q’s massive drainage plan. It differs from the original deal which would have melded the Rupert, Nottaway and Broadback rivers, dubbed NBR. Now the Rupert will be diverted and headed north into the existing, and growing, La Grande megaproject. The new plan floods an area less than one-eighth the size of the 8,000 sq. kilometres that the NBR plan would have covered. In addition, any new Rupert work needs an Environmental Assessment which could take up to three years depending on political pressure. A new group, the Chibougamau-based Rupert Reverence, has sprung up to protest the plan and is composed of Crees and northern Quebecois. They will paddle down the lower section of the river this summer from Nemaska to Waskaganish, at the mouth of the river, from July 20-30. That’s a very steep paddle, by the way, with many huge rapids and long portages, some of which were destroyed by Hydro-Quebec’s study of the river a quarter century ago. resources there. There are currently no dams in Inuit Quebec, the furthest north part of the province but this deal will pave the way for them. It was approved with a 69% vote in favour but only 33% of the population bothered to vote which disturbs many people. Since the defeat of the Great Whale project almost a decade ago, things have been pretty quiet in Quebec . Some have stated that the September 11 incidents caused Quebec to move to insure all its homegrown power. But these ideas are old as are the motives behind them, which are mainly financial. Megaprojects never die, they simply get tucked away in a drawer for future use. The scary thing is whenever they pull one bad one out — a whole pile of other even scarier ones could slip out as well.